Dr. William Thornton was a British-American physician, inventor, painter and architect who designed the United States Capitol, an authentic polymath. He also served as the first Architect of the Capitol and first Superintendent of the United States Patent Office. The earliest of Thornton's known writings, a journal he began during his apprenticeship, records almost as many entries for drawing and sketching as notes on medical treatments and nostrums. His subjects were most often flora and fauna, but he also did portraits, landscapes, historical scenes, and studies of machinery, such as the Franklin stove, and managed to construct a camera obscura. This pattern continued when he enrolled as a medical student in the University of Edinburgh in 1781. The architecture of Edinburgh, especially that of the New Town that was being built, surely exerted considerable influence. More direct evidence of his interest in architecture is found in the landscapes and sketches of castles he drew while travelling about Scotland, notably in the Highlands, during these years. In 1783 Thornton went to London to continue his medical studies; characteristically, he also found time to attend lectures at the Royal Academy. The following year he was off to the Continent, carrying a letter of introduction to Benjamin Franklin, written by his mentor and distant cousin Dr. John Coakley Lettsome. He received his medical degree in 1784 at the University of Aberdeen. Thornton then spent time in Paris, before returning to Tortola in 1786. There, he saw his mother for the first time since boyhood, where he came face to face with the source of his income—half interest in a sugar plantation and ownership of some 70 slaves, the possession of which had begun to trouble him. Eager to achieve fame (and undoubtedly some expiation) in the cause of anti-slavery, he emigrated to the United States of America in the fall of 1786, moving to Philadelphia. His unsuccessful efforts to lead a contingent of free black Americans to join the small British settlement of London blacks at the mouth of the Sierra Leone River in West Africa were looked on favorably by Philadelphia's Quaker establishment. Some leaders of the new republic—notably James Madison, with whom he lodged at Mrs. Mary House's prominent boarding establishment in 1787 and 1788—were cognizant of Thornton's abolitionist activities. In 1788, he became an American citizen. Thornton married Anna Maria Brodeau, daughter of a school teacher, in 1790. During his visit to Tortola between October 1790 and October 1792, Thornton learned of the design competitions for the U.S. Capitol and the President's House to be erected in the new Federal City on the banks of the Potomac. Because a design for the Capitol had not been chosen, he was allowed to compete upon his return to Philadelphia. Between July and November 1792 the Washington administration examined closely designs submitted by the French émigré architect Etienne Sulpice Hallet and Judge George Turner. Hallet and Turner had been summoned to the Federal City in August 1792 to present their ideas to the Commissioners of the District of Columbia and local landholders. Both were then encouraged to submit revisions of their designs to accommodate new conditions and requirements. At the beginning of November Turner's new designs were rejected. The painter John Trumbull handed in William Thornton's still "unfinished" revised plan of the Capitol building on January 29, 1793, but the president's formal approbation was not recorded until April 2, 1793. Thornton was inspired by east front of the Louvre, as well as the Pantheon for the center portion of the design. After more drawings were prepared, enthusiastic praise of Thornton's design was echoed by Jefferson: "simple, noble, beautiful, excellently distributed." For his winning design, Thornton received a prize of $500 and a city lot. The execution of the design was entrusted to the supervision of Étienne Sulpice Hallet and James Hoban. Hallet proceeded to make numerous revisions, including removing the rotunda under which Washington was to be enshrined upon his death. 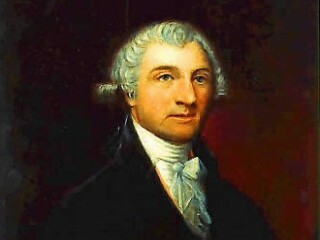 So, on September 12, 1794 the President appointed Thornton one of the three Commissioners of the Federal District in charge of laying out the new federal city and overseeing construction of the first government buildings, including the Capitol of which he became supervisor and remained in charge until 1802. Despite important changes and additions, especially by Latrobe and Bulfinch, much of the design of the facade of the central portion of the Capitol is his.